I’m always on a quest to create amazing meals that are simple and fat loss friendly. 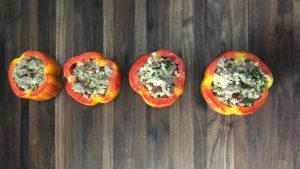 I hit a homerun with these amazing paleo stuffed peppers, filled with riced cauliflower, ground meat, pancetta & jalapeno! Give them a try and let me know what you think! Preheat your over to 375 degrees. 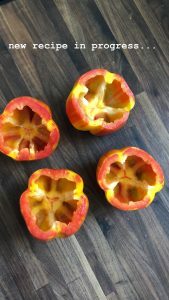 Cut the top off your off your peppers and remove the seeds. In a large skillet, cook your pancetta until it’s crispy. Set aside in a bowl. Add your ground meat & jalapeno into the pan. Cook thoroughly. Remove & set aside. Add cauliflower to skillet and allow to thaw & warm. 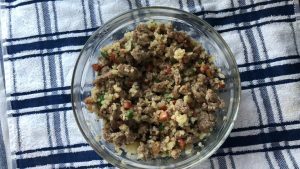 Combine pancetta, meat/jalapeno & cauliflower in a large bowl. Spoon into peppers and place on a baking sheet. As Jve told you before, “Great Minds”! I just made turkey & cilantro cauliflower rice stuffed peppers this week!!! D-E-L-I-C-I-O-U-S !!! !